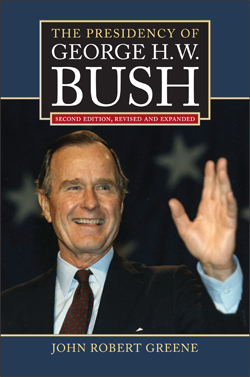 Dr. John Robert "Bob" Greene, the Paul J. Schupf Professor of History and Humanities, director of the Social Sciences Program, and Cazenovia College archivist, has penned a new book, The Presidency of George H. W. Bush (Second Edition, Revised and Expanded), due for release in early spring 2015. Dr. Greene takes "full advantage of newly released documents to revisit Bush's term, to consider his post-presidency accomplishments, and to enhance and clarify our understanding of his place in history." He devotes "ample attention to Bush’s post-presidency relationship with his son, President George W. Bush, and the development of his close friendship with Bill Clinton." For more information and ordering details, visit: www.kansaspress.ku.edu.